Is Apology Due From Those Who Invest in Foreign Tax Havens? Since revelations have surfaced that billions of pounds sterling have left the UK for foreign tax havens there have been calls for people using foreign tax avoidance schemes to be ‘guilted’ into making a public apology. Labour leader Jeremy Corbin suggests that anyone using an offshore tax haven should apologize to the country. One British person who has millions invested in the Cayman Islands is the acting Queen of the United Kingdom. We don’t know if Jeremy Corbin wants Elizabeth Regina to apologize to the British public for investing overseas, and we assume he knows the Queen isn’t required to pay tax under British law, but does so voluntarily. On a more serious note, the Labour leader is quite right to be appalled at those who, having been raised and who earned a good living in one of the best countries in the world, would then take their money out of the country that made them rich to invest it offshore! Why would they do it? Because they can make higher returns on their investment (at higher risk) and it’s a way for companies to lower their overall tax burden, and individuals can hide money from family members. Like taxing any British sterling that leaves the country at 20 percent. That way, HM tax office collects significant revenue and the government can better fund schools, hospitals and roads, etcetera. Even so, some will choose to invest overseas because they can earn 50% returns or better in so-called ‘Frontier economies’ and even having paid such a (proposed) tax they’ll still earn 30% or better. For each individual or business the first 100,000 pounds sterling taken out of the country shouldn’t be taxed, but everything after £100,000 individuals and companies should be required by law to pay the 20% tax. By using this high-ish threshold, Mom, Dad and the kids can go holiday-making in foreign countries and not have to pay the foreign withdrawal tax, perhaps in their entire lifetime. NOTE: For the first £100,000 worth of withdrawals it could go in Dad’s name, then Mom could use her lifetime 100,000 pounds foreign withdrawal limit. Therefore, a family unit would have a combined lifetime limit of £200,000. Once they hit that threshold, thereafter they would pay 20% tax on each pound that they send or spend outside the country. Britain loses about £19 billion annually on so-called ‘Foreign Remittances’ on account of foreign-born workers sending their money home to their families. Who could blame them? Yet it’s a serious problem, but as previous governments haven’t figured out a way to stop it, it’s never been addressed. SIX PERCENT of Thailand’s GDP comes from foreign remittances, for just one example, and many other countries count foreign remittances as an important part of their GDP. 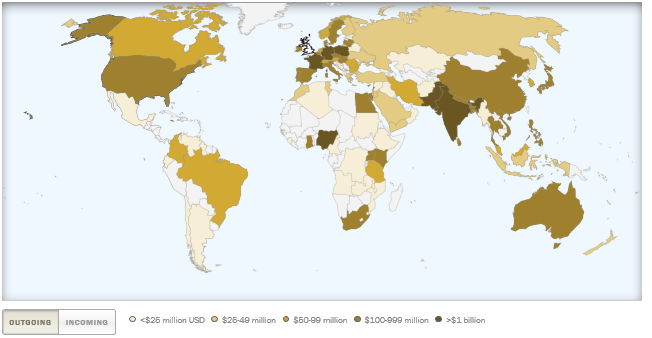 Although foreign remittances are only rough estimates, at least $24,878,000,000 in remittances were sent from the United Kingdom to other countries in 2015 alone. The actual amount could be much higher. Image courtesy of Pew Research. Therefore, expats should be able to send the first 100,000 pounds home without paying the 20% tax — but after that they’re draining the country of money(!) so they must begin to pay the tax when they hit the £100,000 mark. The trick is to be fair with foreign workers who work hard to earn their money, but to stop the UK being unduly taken advantage-of which has been happening for decades. The government relies on voluntary notifications of such foreign remittance sending, so the number is pegged at £3.2 billion pounds sterling on the GOV.UK website. With a 100,000 pound threshold, my tax idea isn’t aimed at *normal citizens* nor is it aimed at *normal expats* sending a few thousand pounds home to their families — it’s aimed at the fat cats, at the criminal syndicates, and at wealthy people who earned or inherited their fortunes in the UK who should be deeply ashamed they’re not re-investing in the country that made them rich. To me, such people should have a fair trial on Friday and if they’re found guilty, let them be found guilty of treason (for that’s what it is, IMHO) and be shot dead on Monday — but that law isn’t likely to be passed in the UK House of Commons anytime soon. It’s Been Going On for Decades; What to Do Now? Perhaps we could say; ‘What’s gone on before now we can leave aside, as there weren’t sufficient laws nor guidance for individuals or companies, and frankly, in past decades the taxation rates were grievous to be borne by both individuals and companies’ — but at this late date we’re going to create new laws (that don’t need to be complicated!) to counter the astonishing, continuous, and increasing run on the country’s wealth. Therefore, the UK government should call banking experts and wire transfer companies to testify (under oath) before the House of Commons as to the general extent of the foreign remittance problem and to quantify and qualify the offshore tax shelter monies that leave Britain annually for foreign tax havens. The goal should be to compel banks and wire transfer companies to become ‘part of the solution instead of part of the problem’ as the government needs the information — the banks and transfer companies have it; the government doesn’t! — and nobody else on the planet could begin to figure it all out. which would drive investment to the UK in the billions, and perhaps a trillion pounds over 10 years. See what plugging a leak can do for the United Kingdom? Foreign tax havens. Image courtesy of Cayman Financial Review. Click the image to visit Cayman Financial Review for general information on foreign tax havens. Are British Women to Blame for High UK Immigration? It’s a proven fact, men can’t bear children. Ask anyone. Therefore, any children born in a country are going to be born to women. And before World War I, British females of child-bearing age were having 3.2 children on average which created a constant, but manageable population growth rate. This translated into a healthy economy — all those new mouths to feed, clothe, educate and shelter — and such birthrates form the basis of every domestic economy. In economies with a high national birthrate per fertile woman, a significant domestic economy exists and consequently, sending raw resources or manufactured goods to other countries *isn’t* required to prop up the economy. When more people are being born than are dying every year, you have the perfect domestic economy — and exports are merely the icing on the cake — and what a ride it is when the domestic economy is growing and exports are growing every year! Woot! That’s how Britain prospered for centuries, until WWI and WWII changed all that. Enough has been written and filmed about Britain’s part in WWI and WWII to fill entire libraries (as it should, and to every living and long-dead veteran, thank you again for our freedom!) but for our discussion today, let’s look at how two world wars changed the demographic picture of Britain. Women entered the formal workforce and began to earn money. This was done because the men were away fighting a war and the country was in a desperate labour shortage. Anyone who could turn a shovel, milk a cow, assemble a rifle, or ‘man’ a telephone exchange, was put to work immediately. Some workers were barely in their teens and had plenty of responsibility on their shoulders. The British people of the last century were truly an adaptable and amazing people who rose to every challenge and succeeded. Often at great personal cost. With most of the men away, women worked up to 16-hour shifts on farms or in factories, and still cared for their household and any children that had been born prior to the war, and Britain’s birthrate fell precipitously. In fact, the birthrate per fertile woman fell below replacement levels and the population of the country as a whole, began to fall. No country can sustain such a falling birthrate, however due to the extremely high wartime demand for weapons and other war matériel the economy continued to function. Not as well as prior to the war mind you, but it still functioned — and apart from borrowing money on the international markets to fund the war machine — Britain’s economy remained sound. The last payment on Britain’s WWI and WWII $120 billion war debt was recently repaid in 2006. The result of all this war was that there was a postwar baby boom and Britain’s economy once again began to thrive. Two profound things changed the British economy forever in the postwar era: 1) British women were likely to put off having children and continue working, and 2) in 1961 birth control pills became available to married women and were later made available to single women. As a result, the birthrate per fertile woman in Britain again plummeted (replacement levels in Western countries is at 2.2 babies per fertile woman) and employers were eager to employ women who were happy to work for less than half of what men earned. In some cases, women were paid only 40% of what their male counterparts earned and no one thought anything about the discrepancy — not even the women. Women’s participation in the workforce increased, and beginning in the 1970’s the rates of pay for women began to rise and even fewer babies were born to British women who were too busy earning income to want children. Consequently, the government was informed by industry-centric economists to open the floodgates to foreign workers (starting in 1999) to meet the demand for labour in the country (which is a different way of saying, ‘bring in the kind of workers who will work for what we used to pay the women’ e.g. 40% of the wage rate for male workers) and British profits will rise again. Indeed they did, but unemployment among British citizens rose and downward pressure on wages began to be a measurable factor. Company profits rose, British GDP rose, productivity fell but later recovered as the foreign workers became more proficient at their jobs and had a better understanding of the English language, and domestic demand for goods and services (which every economy is built on) skyrocketed. All of it is an astonishing success story, Britain with its wartime partners winning two world wars, rebuilding its economy in the postwar era, adding millions of women to the workforce, the introduction of pharmaceutical birth control, near-parity for women’s wages in recent years, high profits for companies and a respectable GDP growth curve. Would UK Women Prefer to Have Babies, or Would They Prefer to Work? The simple answer is, if they could afford to stay home and have babies, they would. Many studies support this finding although a certain percentage of women would continue to work until their 40’s before having children. Even in this era of cheap birth control and relatively plentiful work for women, many women would prefer to stay home and raise children. But due to lower wages as a result of massive immigration many families cannot afford to have one wage-earner staying at home to raise children. And we all know how enormously expensive raising children can be these days. There are always solutions. The question is, are they affordable and acceptable to the majority of citizens? British citizens willing to go through the effort and expense of raising children must receive some kind of assistance paid by an incremental increase in the national taxation rate. Eventually, everyone who pays taxes would be able to recoup the additional portion of the taxes paid when they themselves decide to have children. Let’s say that UK-born ‘Richard’ and ‘Anne’ want to have children. But because of the high costs of food, clothing and shelter in the UK (which you can partially blame on high immigration loads that force-up prices) they decide they must remain working until they can afford to have children. Many Britons are caught in this trap. Why is it a trap? Because every year they remain working, the cost of everything continues to rise and they’re no further ahead after ten hard years of effort. Both people working + one recession = no kids. It happens over and over. Working couples barely reach a point where they feel they can afford to start a family, and BOOM! along comes a financial crisis. Bad for the baby-blanket business! It’s typical for recessions to occur every 15-25 years. So British-born couples like ‘Richard’ and ‘Anne’ may never reach their goal of having children, like millions of other Britons. And if they finally get to the point where they feel they can afford a family — they’re 100 years old like Abraham and Sarah of ancient Mesopotamia. And everyone wonders why Britain has a 1.89 birth rate per fertile woman, which is far below population replacement levels. As mentioned above, 2.2 births per fertile woman is considered replacement level in developed nations. 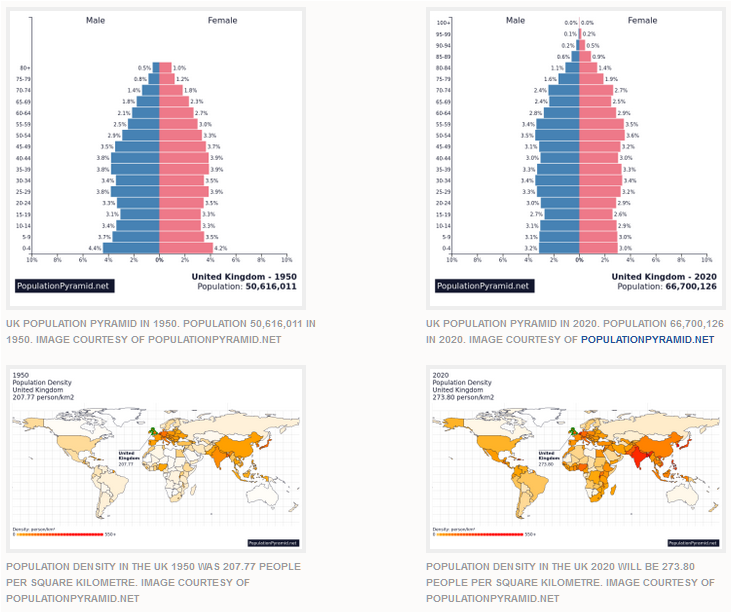 If you want to grow the population and not just maintain the present number, then the birthrate value must rise above 2.2 births per fertile woman. The UK has a long way to go to meet replacement levels, let alone begin to increase the population! If that’s true, why does the UK population continue to increase? One word: Immigration. Families with children receive some kind of payment from the government financed by an incremental tax increase. For those who don’t like higher taxes, hey, that’s your right. But don’t complain when your children are the last native-born Britons in the country! Assuming you don’t want to hand Britain over to foreigners (even though some of them are very nice) UK-born women will need to be compensated for leaving their career and raising children. A monthly payment can make the difference between a falling or rising birthrate. If ‘Richard’ continues to work and ‘Anne’ receives a Parental Guaranteed Basic Income (PGBI) of £1088 per month, it might be enough for middle class families to get by with only one wage-earner. 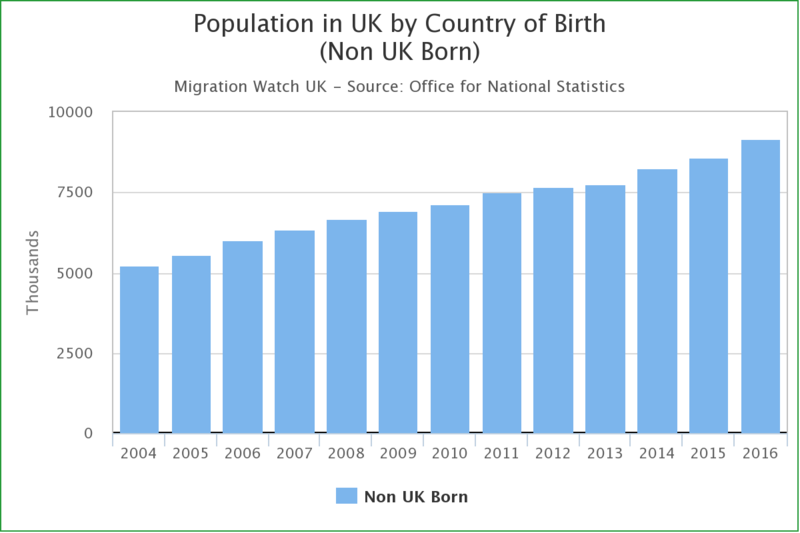 In this way the negative birthrate problem in the UK will eventually be righted and massive immigration loads will no longer be required to sustain the UK population / and consequent domestic economy. Assuming both ‘Richard’ and ‘Anne’ have worked since leaving school and paid their fair share of taxes, when they are ready to start a family they will do so secure in the knowledge they will be able to afford it due to the PGBI system. ‘Richard’ will earn his wages and ‘Anne’ will receive £1088 per month. At income-tax time, they simply combine their income (let’s assume £80,000/yr for ‘Richard’ and £13,056 for ‘Anne’) and pay the normal amount of tax on their combined income of £93,056. If they keep their expenses low, that’s enough annual income to raise one child until he/she reaches 18 years of age. Which is certainly cheaper for the UK than paying double that amount to host one immigrant who will send much of his/her earned money to his home country to help his or her family for as long as he/she remains in the UK. If we’re paying thousands per month for each immigrant (directly and indirectly) to sustain the UK population, why can’t we pay ‘Anne’ less than half that monthly amount to raise a UK-born child? Eventually, ‘Richard’ and ‘Anne’s’ child will grow up to become a worker and he or she won’t be sending thousands of pounds sterling off to a foreign country every year (yes, the immigrants work very hard for their money — they can do what they like with it) but the UK-born child will simply spend their earnings in the UK economy, except for his/her vacations outside of the UK. For as long as ‘Anne’ stays at home raising her children, she can continue to collect the £1088 per month PGBI until she returns to the workforce and begins earning more than that monthly amount, or when her child hits 18 years of age, her PGBI payments will be discontinued. Obviously, the easiest way to run this programme is via a ‘reverse income tax’ where a person’s income, their partner and their child, all appear on the same income tax form. After filing their combined tax form, couples would be notified of their eligibility for PGBI and monthly payments would begin. Caveat: As long as ‘Anne’ is receiving any amount of income over £1088 per month, either via unemployment insurance payments, annuity payments, inheritances, lottery winnings, gifts from family members, or from whatever other source, ‘Anne’ will not qualify for the PGBI payment. If she is earning less than £1088 per month (from all sources) the PGBI programme would top-up her personal income to £1088/month. Although it sounds expensive, it would still be cheaper by half compared to the present method of paying immigrants to keep the UK population at a sustainable level and thereby keeping consumer demand high in the overall economy. Britons are already paying for it… TWICE OVER! Each immigrant represents a significant cost to the British taxpayer, (and yes, they do work very hard to earn a living in the UK, no one is denying that) but in addition to using infrastructure and services in the country just like everyone else, there is a cost differential of about £100,000 per immigrant over their lifetime. The Home Office / Border Force must devote considerable time and effort to immigrants with some costs happening even before the migrant lands in Britain. Immigrants receive the same benefits as UK citizens such as welfare payments, and cost the government in other ways, including police, court, and incarceration costs, higher than average security and certain administration costs that are unique to immigrants — and they displace UK-born workers as they’re willing to work for lower wages. In addition, they send billions of pounds sterling home every year. The figure of £20 billion per year is most often used — but it is likely much higher. Forget about official statistics, the UK government (like most governments) only records those foreign remittances that people volunteer (£3.2 billion) to share with the government. Banks and wire transfer services like Western Union know the real deal on foreign remittances. And that’s costly to the UK economy. Just divide £20 billion by the 8 million foreign-born residents in the country and you’ll see how costly ‘foreign remittances’ are for the United Kingdom. The final note on foreign remittances is terrifying. Such payments are notoriously difficult to prove, but the standard number of £20 billion/yr is a guesstimate. It’s widely acknowledged that UK foreign remittances may be double that amount, and could in the very worst-case scenario top £56 billion per year. And you don’t want to know the grand total of foreign remittances since 1999. No matter the number, it’s a lot of money leaving the UK that will never, ever, return. What could those billions have done for the UK economy? We’ll never know. ‘Cutting Our Losses’ Covers Half of the Cost of a Parental GBI, but More Tax? In addition to lowering immigration to low levels because UK-born women would be having more babies — there would need to be an incremental tax increase. A Tobin Tax is simply a tax on all financial transactions in the country. It’s called an ‘invisible tax’ because banks and retailers simply add an internal 1% tax to each and every financial transaction and remit the revenue to the government annually. Buy or sell some stock, it costs you 1% more than at present. Buy a beer, it costs you 1% more than at present. Take £100 from the ATM (yes, that’s a financial transaction) and the bank charges you 1% on the total amount. Buy some petrol and 1% is automatically added to the cost. Basically, whatever you purchase is going to cost you 1% more unless it’s something that costs more than £100,000 — because you pay the Tobin Tax only on the first £100,000 on any individual purchase. Which is nice when you’re buying an Airbus A380 or other large purchase. Yes, nobody likes higher taxes that’s for certain. But there’s no rule that the Tobin Tax must be set as high as 1%. Some Tobin Tax proponents suggest it could be used to fund special projects like a GBI for UK parents only — in which case it could be set at .2% on individual purchases. Does lower immigration, lower foreign remittance levels, more UK-born children to keep the population stable, and more jobs for Britons matter to you? Or does a Parental GBI funded by a .2% Tobin Tax nullify those gains? Immigration policy continues to appear in British headlines and excessive annual immigration loads in the UK are cited by many citizens as one of the main reasons Britons voted to Brexit the European Union. Immigration has been a factor in Britain going all the way back to Roman times, and without it the United Kingdom wouldn’t be the thriving country it is today. As with so many things in life it’s all about balance. The other important factor in this discussion is the implementation of immigration policy. Britain has a population of 66 million people and it received 650,000 economic migrants and refugees in 2016 alone. Yes, it’s like that every year. Of course, people in favour of higher immigration levels will always refer you to the net migration number, which was 335,000 in 2016. Immigration to Britain for year ending June 2016. UK Office for National Statistics. Regardless of how you choose to calculate UK immigration, millions of Britons have a negative view on the topic and blame scarce jobs, higher infrastructure costs, longer wait times for government services and higher taxes on unprecedented immigration. High numbers of migrants aside, the UK economy continues to grow and companies are making better profit due to the lower wages paid to immigrant workers. No economist on the planet will dispute these two points; Higher immigration results in improved corporate profit and growing GDP. Although it needs to be said that the economy can still grow with lower or even zero immigration when government economic policy is perfect and all the stars are aligned. By now you’re concluding that high immigration loads are the lazy politicians way of improving the annual GDP statistic, increasing corporate profits, and (probably) increasing donations to their political party. Yes, every economist agrees with you. If increased profits for companies, higher GDP, and donations to your political party are all that matter to you — you’ve hit a home-run! as they say in America. Congrats to you. Others disagree and cite quality of life issues — real life problems like increased unemployment among native Britons, longer wait times for government services, and the higher personal taxes that pay for the rapidly growing infrastructure required to sustain increased demand. Your view no doubt, depends on which side of the unemployment line you’re standing on and your tolerance for higher taxes. It’s easy to see where all this is heading in a decade or two; Those who view immigration negatively will join new, right-wing, anti-immigrant parties similar in concept to Germany’s nationalist AfD party, while big business and (some) politicians will morph towards Trump-style politics — resulting in a quantum shift to the right of the political spectrum among a majority of voters (but very important to note here) that shift will split between many factions. And isn’t that exactly what has recently happened in Germany, Hungary, Austria, Poland and America? Is Multiculturalism a Failure, or is Implementation to Blame? It’s interesting to note that Canada has maintained a multicultural policy since the late 1960’s and that it’s been an astonishing success story with few Canadian detractors. 4) to access the low wage workers to do the jobs Canadians no longer wanted. It was also touted to diversify the social fabric of the country and work to subsume the extremely stark (and sometimes hostile) divide between Francophones and Anglophones in eastern Canada. The level of skepticism was high, but because multiculturalism in Canada was properly and thoroughly sold to Canadians and because it really did accomplish all that Pierre Trudeau said it would, multiculturalism succeeded across the country. In recent months, Statistics Canada has reported the number of visible minorities (people from other countries and their Canadian-born offspring) living in Canada now outnumber Caucasian citizens of European descent. And nobody cares. In Canada, the colour of your skin, your choice of religion, or your cultural bias, simply don’t matter. If you’re there to work, raise a family, and agree to abide by Canadian laws, Canadians are happy to have you along for the ride. And in Canada émigrés tend to do what is expected of them because everything about becoming a ‘landed-immigrant’ and (after a significant probationary period) a Canadian citizen, is explained to them prior to their acceptance by Citizenship and Immigration Canada. Unlike in Britain, migrants to Canada are walked through the process every step of the way and because of that, they are far more likely to understand Canadian values and Canadian culture, and are therefore more likely to assimilate well and become part of the Canadian mosaic. The importance of informing future British citizens about what is allowed and what is expected of them cannot be underestimated — and the same importance must be attached to informing today’s British citizens how to work with new arrivals. It’s everything in this discussion. In Canada, the federal government wanted multiculturalism to work and that’s why it worked. Full stop. It’s taken decades for the UK to get to this point and every party represented in the House of Commons has been a part of the process. Playing the blame game is a waste of time, so let’s just focus on what’s to be done from here. There is little Britain can do about the 9 million foreign-born residents already in the country. Of course, the argument could be made that they could all be deported to their countries of origin, but that isn’t a realistic solution to a perceived problem; “perceived” because less than half of Britons report being concerned about the number of immigrants in the country. In 2016, the total number of foreign-born residents in the UK surpassed 9 million. UK Office for National Statistics. Some have made the case that UK expats convicted of any crime more serious than a parking ticket should be deported to their country of origin, forthwith. There are plenty of people already breaking laws in the United Kingdom, the country shouldn’t be importing more of them! And at an annual cost of £110,000 per year/per prisoner to incarcerate lawbreakers, Britain could save itself millions of pounds sterling annually for the cost of a few hundred airline tickets. Doing so would set a precedent, the kind of precedent that gets noticed for all the right reasons, and work to a) convince certain types to not relocate to the UK in the first place, or b) convince those already in the UK and considering committing crimes to choose an alternate lifestyle — either way, it’s a win-win for Britain. Prime Minister Theresa May has indicated that foreigners living in the UK will be paying an annual fee to help pay a tiny portion of the infrastructure, services, and security costs on a per capita basis — likely around £100 per year, per expat. The PM in a recent PMQ period mentioned the fee would be “about the cost of a passport” but would be due on an annual basis. One great thing about Brexit is the government will be able to choose its own immigration policy. Britain should cap total immigration at 200,000 per year, but it should favour highly skilled individuals from the Commonwealth and America who should be moved to the front of the line. If there are any additional spaces to fill, then and only then should Britain consider allowing people from other countries to migrate to the United Kingdom. Proper guidance to help prospective immigrants choose whether Britain really is the country for them, whether they are willing to live by the laws and (Western) culture of Britain, and guidance on how to integrate into British society would smooth the path for migrants and citizens alike. It’s not only new arrivals that need guidance. A bit of knowledge, understanding and sensitivity can go a long way to keep small irritations small, rather than to have them burst into the media spotlight in a way that makes all sides look mean-spirited, uncultured and uneducated. Canada has a verifiable track record of success in helping both their new arrivals and their citizens to get along together and keep them focused on working for the good of the country and its goals. If the Home Office hired one experienced Canadian multiculturalism / immigration officer per UK immigration office location (as an advisor) it could make the difference between a successful immigration policy and a failed immigration policy. And that Canadian multicultural officer should assist in cases involving both new arrivals to the UK and long-time expats with unresolved issues. Brexit affords the United Kingdom the opportunity to start with a clean sheet and design any immigration policy it chooses. Incorporating some Canadian success seems appropriate, as does deporting criminal expats within a fortnight. And an expat tax reminds expats it’s their privilege not their divine right to live in the United Kingdom — although if they’re contributing to the good of the country about as well as anyone else, the UK government and its people should be respectful of their commitment.